• Sam Alvey vs. Antonio Rogerio Nogueira: Antonio Rogerio Nogueira def. Sam Alvey via KO (punches) at 1:00 of Round 2. 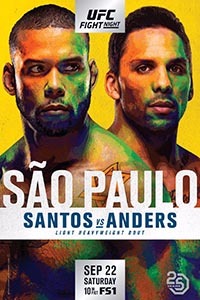 • Renan Barão vs. Andre Ewell: Andre Ewell def. Renan Barao via split decision (29-28, 28-28, 29-28). • Randa Markos vs. Marina Rodriguez: Randa Markos and Marina Rodriguez fight to majority draw (29-28, 28-28, 28-28). • Christos Giagos vs. Charles Oliveira: Charles Oliveira def. Christos Giagos via submission (rear-naked choke) at 3:22 of Round 2. • Evan Dunham vs. Francisco Trinaldo: Francisco Trinaldo def. Evan Dunham via KO (knee to the liver) at 4:10 of Round 2.